Today we’re going to look at executive MBA program options: MIT Sloan’s executive MBA program, which is relatively new, but more typical in structure; MIT’s part-time MBA program; and the MIT Sloan Fellows program, a full-time immersive executive MBA program. We are going to learn about them from Johanna Hising DiFabio, Director, Sloan Fellows and EMBA Programs. Johanna worked in business after earning her undergraduate degree from Ithaca College in 2000. 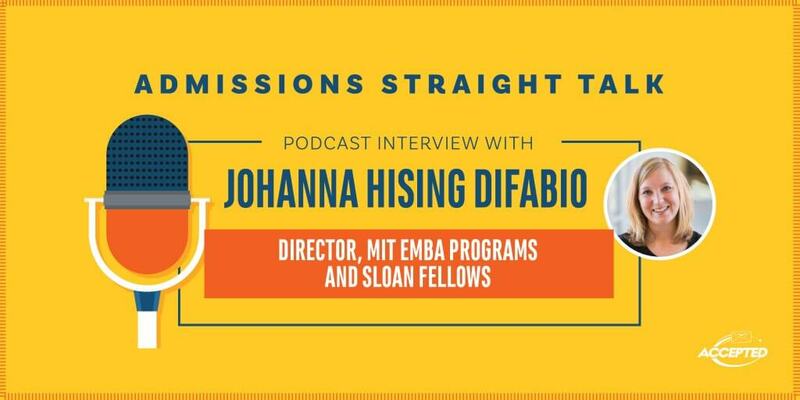 She came to MIT Sloan as Associate Director of Student Life and Learning in 2010, became Director of MIT’s EMBA program in 2014, and added the Sloan Fellows program to her responsibilities in 2017. The Sloan Fellows program, at over 80 years old, is I believe the oldest executive degree program in history. It’s a one-year, mid-career, intensive fulltime program. Our students come from all over the world for a year to study a curriculum in general management. They start in the summer, and in the fall and spring they have lots of electives to choose from if they want from within the full-time program, as well as other opportunities to fully immerse at Sloan and MIT. Eight years ago we started the EMBA program. We were a little late to the market with this degree in comparison to other universities out there. We started it with the aim of the curriculum being heavily action-learning focused. Students come every second or third Friday/Satday and spend six hours a day in class with the focus on going back to work on Monday and applying what they’ve learned. It is a 20-month executive program, and we are looking for general managers with experience managing teams and managing businesses. The EMBA program provides an opportunity to earn a general management degree with a few electives but not as many as Sloan Fellows has. They share the core general management curriculum, and with both degrees we expect significant work experience coming in. Both programs also have fantastic cohorts – we hear that across the board. One aspect where they differ is on the EMBA side we expect them to have a job and be working, while with Sloan we expect them to not be working and fully immerse themselves in the program. The Sloan Fellows program is 12 months vs 20 months for the EMBA program. Sloan Fellows also offers many more elective opportunities, while the EMBA is fairly lock step and action learning focused to apply their learnings immediately. On the EMBA side 45% of students are born outside of the US but the vast majority are working in the US, and with Sloan Fellows 75-80% of the population is from outside the US, with most bringing their families. Neither program requires financial sponsorship, but of course time sponsorship is required for both. There is innovation in the content students are taught. In the core there is an innovation-driven advantage in Sloan Fellows, and on the EMBA side there is entrepreneurial-driven innovation. I would also say that on MIT’s campus, innovation is in the air. There is constant conversation between faculty and students, and we bring students to labs to see what faculty and post-docs are working on. We also look for an innovation mindset in the admissions process. We have a summer accelerator, and we have three Sloan Fellows’ companies involved in it and one EMBA’s company this year. We have companies that get started here- students come in with ideas and then further develop them while in the program. I would say 50% of those students come in having been entrepreneurs and the other 50% are looking at dipping their toes in this area. On the other hand, in terms of career transitions, I am stealing this line from one of our alums, “Students come to MIT executive degree programs because they want to move from success to significance.” That says it all to me. We have a Bring Your Boss to Campus day with the EMBA program, and with Sloan Fellows we have companies coming on campus all the time. We make it very clear that people don’t give up time away from work to not have some sort of advancement, so it is up to the organization to figure out how to provide that advancement. If companies don’t provide it, they can’t blame students for looking elsewhere. What we provide at Sloan is career-strategic advice. What we are trying to do is provide them with the skills and knowledge to be very strategic about where they want to go in their careers. How do they think about their career? How do they make a good resume? How do they create a good LinkedIn profile? What about their network – which at this point is one of the most important aspects to advancement in their career? We provide guidance on those types of things. We have recently hired a new Director of Career Coaching, and I am really excited about the opportunities provided there. One thing we don’t offer is the opportunity to go through the typical recruiting process as a full-time student does, with interview signups and the like. Recruiting at the executive level doesn’t work like that. We are looking at people with 14-17 years of work experience, so I don’t have a homogeneous population going into homogeneous roles, and recruiters have less interest in coming to campus because they have five roles they are looking for the same type of person to fill. It is much more about networking than anything else. Scheduling is always a challenge. Everyone is super busy. We have a student life office, and they are always trying to create opportunities for cross-networking. That happens with Sloan Fellows more often because they are in classes with some of the two-year MBAs, but also with the Sloan Fellows and EMBAs we have events together. But students want more and we always want to try and do more. Unfortunately I don’t have the silver spoon for that. It is a combination of things. We want to see a minimum of ten years of experience. From there, we look for someone who has led teams and/or businesses, and typically is an industry expert, is quant-comfortable, and has a story to tell. We are very interested in creating a diverse community, so we look for a variety of backgrounds and experience, as well as impact in the world and the interest in creating positive change in the future. We also want someone who can work well with others. For Sloan Fellows the profile we are looking for is very similar, though we do look a little younger, at times 8-9 years, but we still want general management experience or perspective. We read the application from cover to cover, and we want to learn as much about you as possible, so use new examples. I would say it’s very similar for both programs. The first mistake is sharing information they think we want to hear vs information that reflects who they are. Also, MIT is very merit-based, so I want references who have worked with you in the past who can provide examples. If it is someone who has graduated from MIT and knows the culture and has worked with you, great. But if it is someone who graduated from MIT but has never worked with you, we don’t find that very helpful. Those are the two biggest mistakes I see. I think it’s the people. The students are just fantastic on both sides. I often say you will learn just as much from the students as you will from faculty. As cheesy as it may sound, they become family. You will be able to rely on these people for the rest of your life. When you have an opportunity or challenge you can reach out to them and you will have support from all around the world. I highly recommend talking to a current student or alum, starting with registering interest on our website. Our admissions advisors would be happy to connect you with someone. No one can talk about this program like our students and alums, and the more transparent we can be the better. We are constantly innovating. We like to change and are constantly gathering insights from students and faculty. One aspect is how do we get more data into our classes? This year we added a Data Analytics Certificate, and at graduation we had 30 Sloan Fellows and 10 EMBAs with this certificate. There is a lot of talk about fintech and blockchain, and we are looking at those types of pieces of content being added to the curriculum.